What's the difference between shiatsu and massage? What's all this "qi" stuff? Does it really work? Office in Catonsville, Serving the Greater Baltimore area. What is shiatsu? What is acupressure? Give the gift of wellness! Buy an EarthTouch gift certificate, for an office visit or a housecall. Housecalls are available in a limited area around Catonsville and the Greater Baltimore region. If you wish to purchase a housecall, please enter the Zip code -- the housecall fee varies by location. Gift certificates expire one year from date of purchase. Since certificates purchased on this site are sent via e-mail, you must provide your e-mail address. Nationally certified by the National Certification Commission for Acupuncture and Oriental Medicine. Certified Practitioner, American Organization for Bodywork Therapies of Asia. State of Maryland Licensed Massage Therapist. 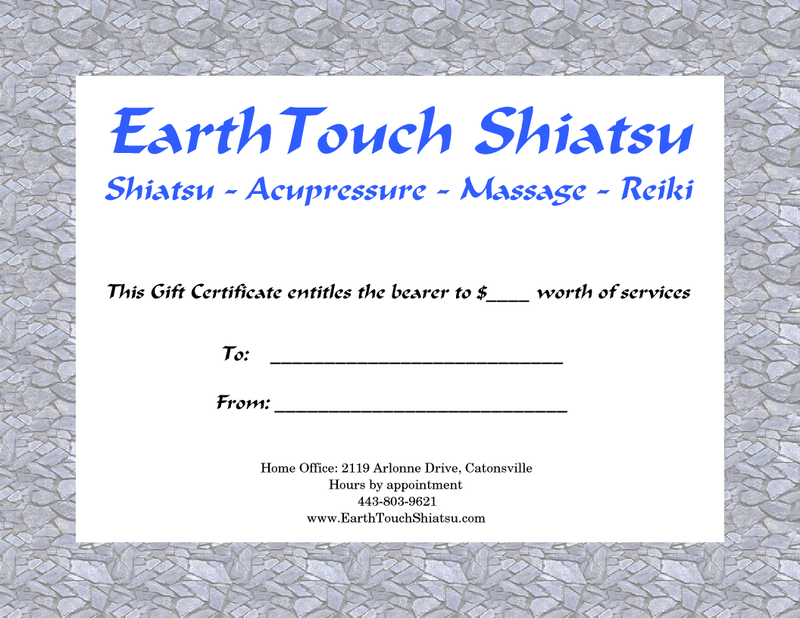 E-mail or call Tom Swiss at 443-803-9621 today to schedule your shiatsu or massage session!